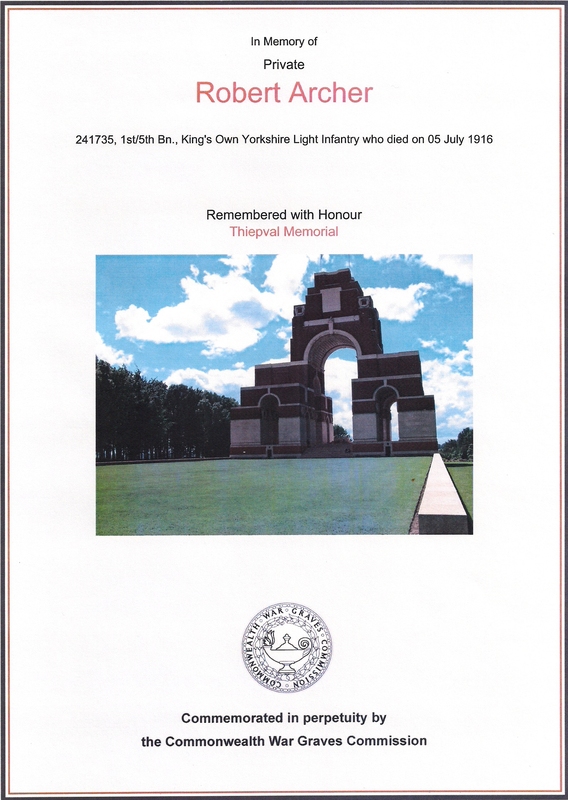 Private 4577, 241735 1st/5th Bn., Kings Own Yorkshire Light Infantry. Memorial ref. : Pier and Face 11 C 12 A. Born on 16th August 1884, in Swayfield, Lincolnshire. Robert was one of eleven children, ten brothers – Mark, Edward, Sam, Ben, John, Frank (Francis), Luke, Matt, Job and one adopted sister – Charlotte. He was the son of Thomas Archer, a ‘common carrier’ and Susan Archer (nee Bullock). By 1901 Robert, aged 16, had moved away from home, working as a cattle boy for William Woodcock on a farm at Lyndhurst, Skegby near Mansfield, Notts. All of the employees on the farm, including Mr Woodcock had Lincolnshire birthplaces so perhaps it was this Lincolnshire connection that caused him to move to the Skegby area. Robert’s parents were still living at Swayfield in 1901 and his father Thomas was then a farmer employing three of Robert’s brothers as farm workers. On 31st July 1909 at Christchurch, Ironville, Robert, then of 35 Market Street, Ironville married Margaret Annie Parkin and by 1911 they were living at Main Road, Jacksdale in the home of Margaret’s widowed grandmother. Robert was employed as a labourer at the iron works. Robert later changed his occupation as, prior to joining up, he was employed as a railway plate layer. 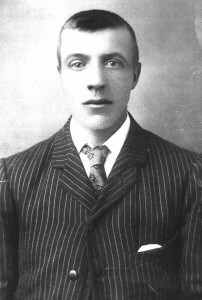 Robert enlisted on 7th August 1915, at Doncaster, only nine days before his 31st birthday. He was sent to France on 19th March 1916 and killed in action, during the Somme Offensive only four months later, on Wednesday 5th July 1916. The Army sent effects amounting to £1 10s 8d to his widow in June 1917 and a war gratuity of £3 in October 1919. He left his widow, Margaret Annie and two sons, Sam aged 8 and Percival aged 6 . Their baby daughter, named Sylvia had already died aged only one year and her death was registered in March 1915. Just a few short months after this terrible loss, Robert was in the KOYLI’s training for trench warfare. Codnor Park. Suicide. – A verdict of “Suicide by drowning” was returned at an inquest held on Friday on Margaret Annie Archer, aged 33, of Main Road, Jacksdale. The deceased, who was a widow, was found standing up under water in the canal at Codnor Park early on Thursday morning, life being extinct. She had not been in the best of health during the last month, and Dr. F. S. Boreham, who attended her, described her as highly nervous. There was insufficient evidence to show the state of her mind. Jacksdale Woman Found Drowned. Mrs. Margaret Archer, aged 36, a war widow, residing at Main Road, Jacksdale, was found drowned in the canal at Codnor Park yesterday (Thursday) morning. She leaves two children, both boys, aged 12 and 15 years. Of late the deceased had been in ill-health and very depressed. Margaret was buried at Westwood, St. Mary’s. The two orphaned boys were adopted by their Aunt Charlotte and moved back to Swayfield to live with her. Percival was put to work in a bread bake house but by 1926 had run away to Nottingham and later joined the RAF. His brother Sam died only two years later in 1928 at a relatively young age. Percival went on to attain the rank of Squadron Leader and after his RAF career, retired to Bollington, Cheshire with his wife Doris. Robert Archer is commemorated at The Thiepval Memorial, The Somme. This is the Memorial to the Missing of the Somme and bears the names of the 72,193 officers and men of the UK and South African forces who died in the Somme sector before 20 March 1918 and have no known grave. He was awarded the Victory and British War Medals.